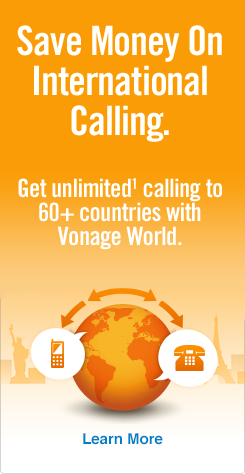 With Vonage, calling the U.S. from Mexico has never been easier! Relocating to another country for work/school/etc. can be stressful, so staying in touch is essential — and Vonage is making it easy to learn how to call the U.S. from Mexico. We’re shipping Vonage Boxes™ (VoIP phone adapters) to Mexico from the U.S. with UPS — which are easy to set up, portable and provide amazing call quality anywhere in the world. What’s the most affordable Vonage plan to call the U.S. from Mexico? Connect with those you care for with the Vonage World® plan. Calling from Mexico to the U.S. is unlimited¹ (landlines or mobiles), as the U.S. is one of 60 countries included in this plan. Call quality is seamless, strong and steady; stay connected with no interruptions. Domestic calling — Vonage Boxes shipped from the U.S. to Mexico have U.S. numbers, meaning any U.S. call to those Vonage Boxes are domestic, as they’re U.S. numbers calling U.S. numbers. Not worrying about surprise charges or unreasonable rates from international calling cards or foreign phone services, allowing you to connect more often for less.